Home Blog General Are English Bulldogs Hypoallergenic? Though adorably grumpy in his expressions, the English Bulldog is actually an incredibly goofy, happy dog that makes great family pets. He’ll entertain you on end with his random bouts of silliness and quirky habits, and will be eager to lounge around with you throughout his life. But if you’re looking for a dog that produces little dander to make things easier on your allergies, the English Bulldog isn’t for you. With a short frame and a sleek coat, it’s easy to understand why people have long thought that the English Bulldog is hypoallergenic, but unfortunately; this breed is not. In fact, English Bulldogs are quite far from it and are about as allergenic as a dog can be. Bulldogs actually shed quite a bit, and produce allergens in other ways you may not have even considered. This breed will require plenty of maintenance beyond the frequent vacuuming that his constant shedding requires, and may be a nightmare for a family who has someone with dog allergies. Let’s take a look at why. While no dog is truly hypoallergenic, some are easier to deal with than others, but English Bulldogs do not fall on the low-allergen-producing spectrum. Though people assume they would be allergen-friendly, this breed sadly produces quite a lot, even much more than other dog breeds. The misconception stems from the misassociation that short-haired dogs are less likely to trigger allergies, but this simply isn’t true. Hair is only part of what triggers a person’s dog allergies. In fact, humans aren’t actually allergic to the dog fur itself at all, but what sticks to it. Your allergies are actually triggered by a dog’s dead skin cells, saliva, and urine. A dog is considered “hypoallergenic” because they have a low level of shedding, even though this is just part of the allergy equation. Also, no dog is actually truly hypoallergenic anyways. However, with such breeds, allergies are typically held at bay because the dog doesn’t shed as much. So while shedding is indeed a major trigger for allergies, the more technical association is that the triggers are actually caused by the proteins found in a dog’s dander, saliva, urine, in addition to his hair. This is why we say there are no dogs that are truly hypoallergenic — because all dogs produce these proteins to some extent. Some dogs, like Miniature Schnauzers, have double coats that shed minimally and are thus considered a more allergy-friendly breed. However, the English Bulldog produces a lot of allergen triggers, and if you have allergies, this is a breed to stay away from, no matter how cute you might think he is. 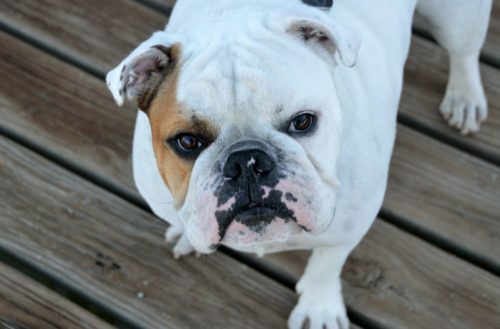 While the English Bulldog doesn’t shed heavily, they do consistently throughout the year, which means you’ll never have a break from the daily cleanup of these allergy triggers. English Bulldog’s sheds short, point hairs that can get trapped in anything, regardless of whether you have hardwood flooring or carpet, as well as covering any furniture that he is allowed to get on. This means fur will constantly be everywhere in your home, even floating around in the air. ays going to be plenty of allergens in your home if you have one of these dogs. You might think having your pup stay outside could provide you with some relief, but unfortunately, this isn’t a breed that is suited to living outdoors. This is especially true if you live in a warm climate area, because English Bulldogs are very susceptible to canine heat stroke. So again, if you have dog allergies, this is decidedly might not be the breed for you. Unfortunately, the English Bulldog does require a great amount of dog grooming, and it’s not just to keep him looking cute and keeping his coat soft — it’s for health reasons as well. The English Bulldog has wrinkles on his face that will require frequent cleaning. You’ll need to keep pet wipes handy to wipe his skin folds daily in order to keep them clear of potential infection. You should also wipe his ears to avoid wax buildup and debris, which also can lead to infection. Beyond that, you’ll need to trim his nails and brush his teeth regularly.